Are you often overwhelmed by dinner time? Does feeding your family quality food seem even more challenging with a busier-than-ever schedule, holiday exhaustion, and travel? Are you getting take-out pizza one (or two) too many times a week? Do you want to minimize your family’s sick days by ensuring healthier eating? What if there were a way to easily have high quality meals ready to go at any time? What if they are your family’s favorite meals? What if this takes no additional money and a minimal investment of time that pays dividends far beyond that time investment? Sound too good to be true?! Sound like an infomercial? Well, it IS possible and it is simple. This month we’re going to explore the Wonderful World of Freezer Meals. See? It can start quite simple and grow from there. Even just preparing the meat or beans eliminates or drastically cuts the daily cooking time. For those types of meals you may only need to grate cheese and chop veggies. My method is to occasionally double or triple a recipe, eating one batch for dinner and freezing the others. I also tend to choose dishes that can simply placed in the crockpot or oven for no-hassle preparation on the day of eating. Since I tend to use my freezer meals on extra busy days or days that got unexpectedly off track, over time it’s easy to accumulate a small stock from which to grab when needed. 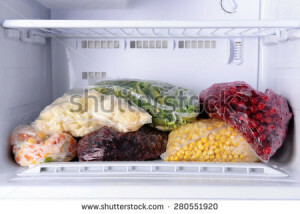 This is also a great approach for those with very limited freezer space. In addition to having a one time party, you can also create or join a freezer meal club. Clubs can come in many forms and work in various ways. They meet social, community, financial and time-saving needs. They meet regularly to either prepare or exchange meals. 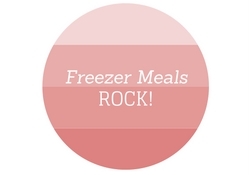 See this article for more ideas on freezer meal clubs. What a great way to make meal planning and preparation fun! But if you’re not so concerned about fun and care more about just being productive, try some of the suggestions above. Start by tripling your batch of beans and freezing two of them to see how much easier meal time is next time you need those beans. Or double your next meal and freeze the second portion. Even those easy steps will reap you productivity rewards. NEVER done freezer meal cooking before? Here’s a FREE workshop from Erin Chase (yes, the $5 Dinners lady). Familiar with freezer cooking but get bogged down with the planning, list-building and meal creation? Or don’t like the freezer meal recipes you’ve seen? Then you should check out MyFreezeasy, also from Erin Chase. A small investment leads to huge savings in time and your grocery budget.